Julia Child’sThe French Chef debuted on public television in 1963. Its successful 10-year run inspired a model for a flood of new cooking shows and culinary stars throughout the 1970s and 1980s. In 1993, a new cable channel, Television Food Network, turned cooking and food shows into 24-hour entertainment—a round-the-clock affirmation of Julia’s instinct that demonstrating omelette-making would appeal to viewers. 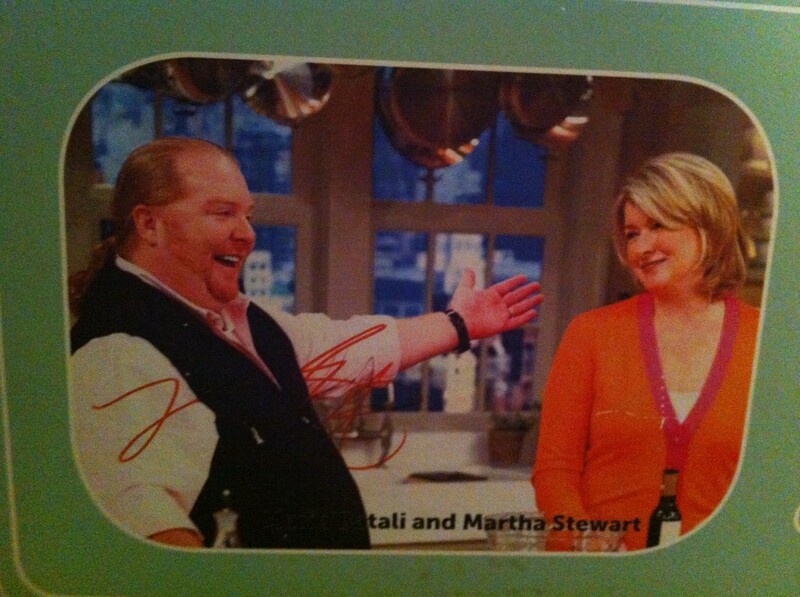 Martha Stewart and Mario Batali, 2007. “Martha Stewart Living” first aired in 1993. Batali, who joined the Food Network in 1995 starred in “Molto Mario” beginning in 1997. Krispy Kreme of Winston-Salem, NC, had been making doughnuts since 1937. In the 1950s as the company expanded to a small chain of stores, it sought ways to ensure a consistent and profitable product. 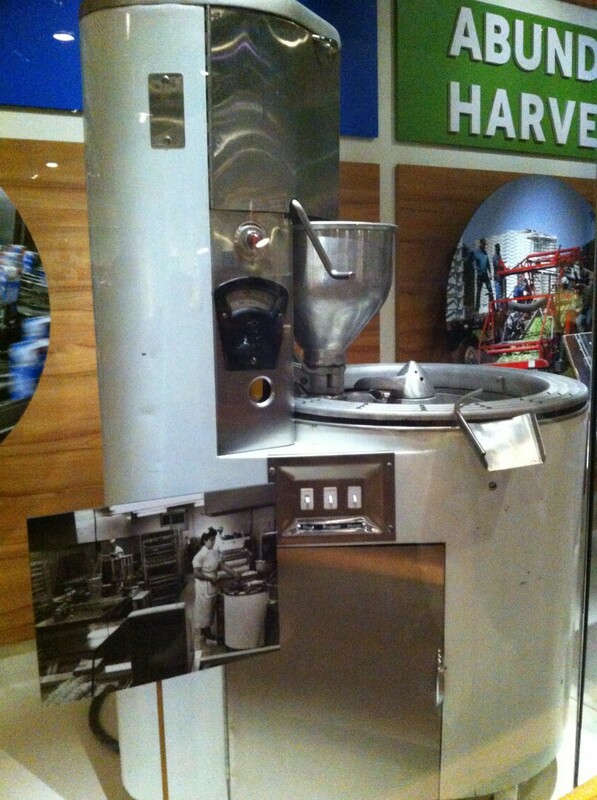 They created a dry doughnut mix and developed a machine that automated the doughnut-making process. The Ring King Junior formed, fried, turned, and cooled about 60 dozen doughnuts per hour, reducing labor costs. Engineer and inventor, Joseph T. Listner was early to recognize the appeal and convenience of bagged, ready-to-eat vegetables. 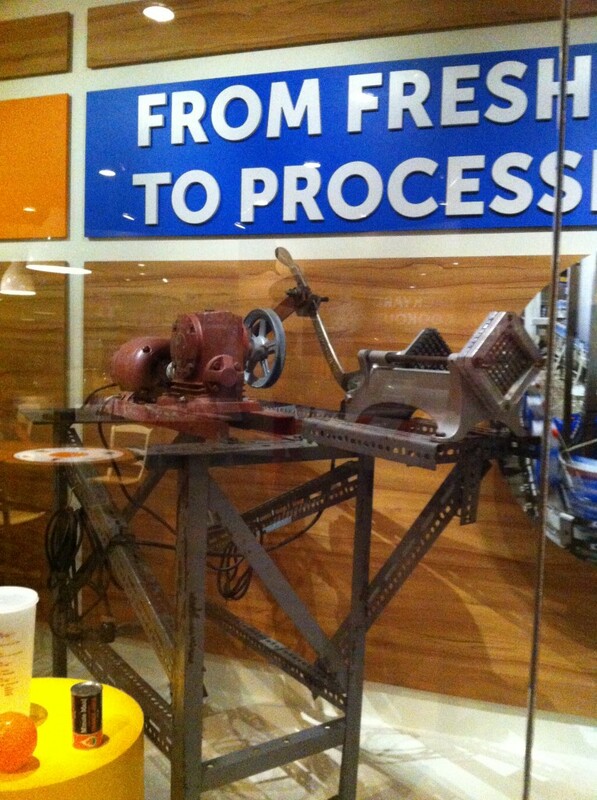 In 1959, he designed and built a one-of-a-kind machine that sliced raw carrots into sticks. The machine enabled a small-scale producer like Listner, Inc., in Wallington, NJ, to slice an estimated one million pounds of carrots in 16 years of operation. Listner sold his bagged carrot sticks and cole slaw to stores, including the Grand Union supermarket chain. Listner made his slicer with components from other machines. Although the carrots still had to be peeled by hand, the machine automatically trimmed them to uniform sticks. 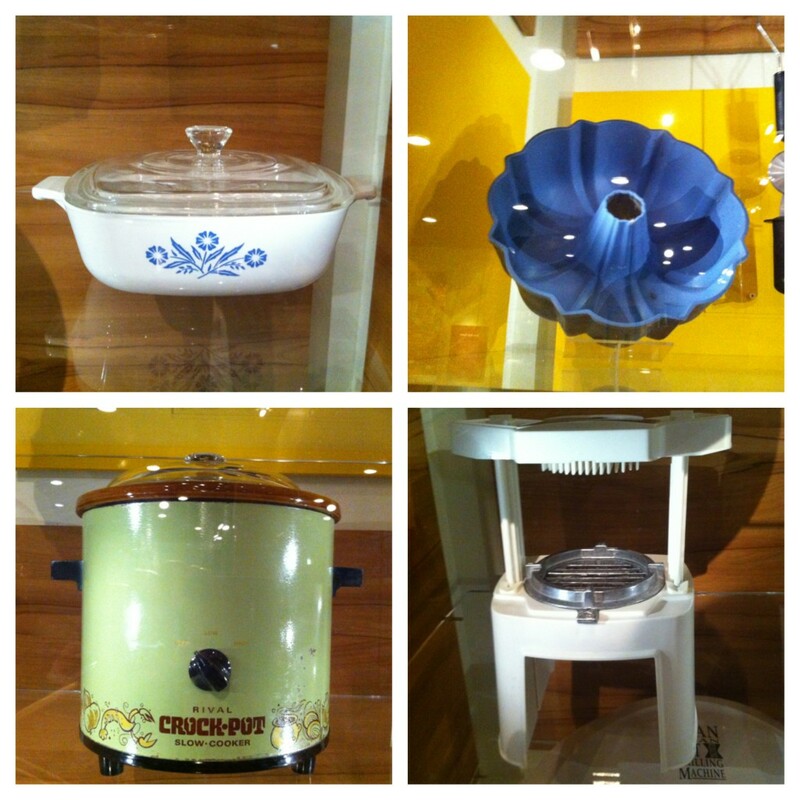 Using materials developed before and during World War II, manufacturers created a variety of new equipment and appliances for postwar cooks. 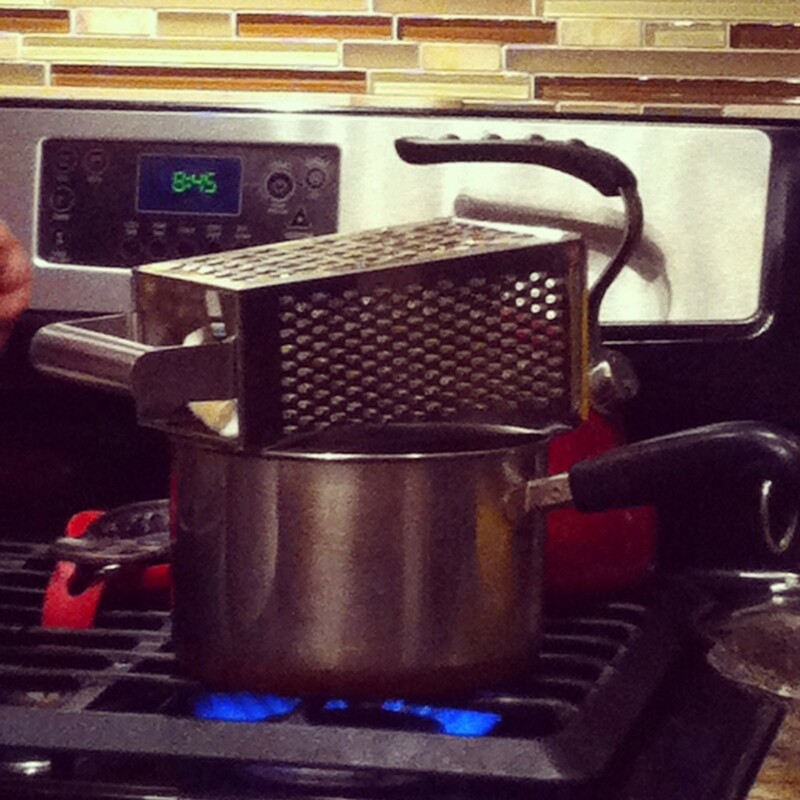 New plastics, non-stick-coatings, and pyroceramic glass were among the most successful. Tupperware, Teflon, and Corning Ware housewares took their place in many American kitchens next to old reliable glass jars, and cast iron and aluminum skillets. Brand-new electrical gadgets consumed ever greater amounts of counter space. Zinfandel was one of the grapes associated with cheap jug wines widely produced after the repeal of Prohibition. During the replanting of California’s vineyards in the 1960s and 1970s, acres of Zinfandel were ripped out to make way for the new darlings of the vineyards, Cabernet and Chardonnay. One vintner who kept his Zinfandel grapes was Bob Trinchero of the Sutter Home Winery, who used them to produce a dry, rosé-style wine. In 1975, while his grapes were fermenting, the yeast died before the wine’s sugar was converted to alcohol. He decided to try selling the resulting slightly sweet pink wine. Many Americans still had a “sweet tooth” for wine, and his “blush,” called White Zinfandel, was a runaway hit. 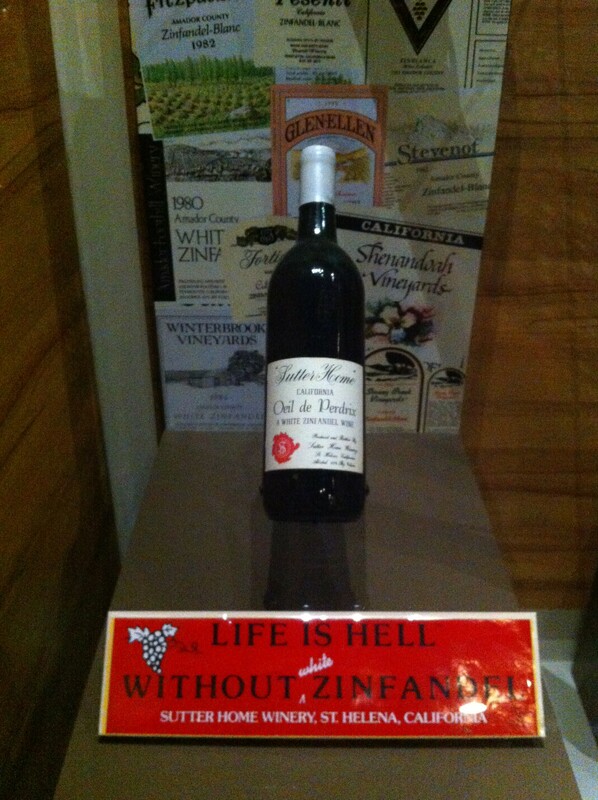 This is one of the first bottles of White Zinfandel made by the Trincheros of Sutter Home Winery in 1975. They named it Oeil de Perdrix, or Eye of the Partridge. The Bureau of Alcohol, Tobacco, and Firearms later rejected the name, so this new wine became, simply, White Zinfandel. The bottle is on load to the exhibition from Trinchero Family Estates and Sutter Home Winery. Below is a bumper sticker. Note: Photos were taken in the exhibition and text is pulled from exhibit labels.